Jeff Lucas' newest book looks at how Elijah was shaped, moulded by God into a man whose faith bloomed in every season. Taking the life of Elijah, Jeff Lucas explores how God's Spirit helped him to overcome the challenges of a life in service, challenges both practical and spiritual that we all face today. Faith for all Seasons provides the path to a lasting faith. The same faith of Elijah's that defied nations, survived the desert and starvation, and overcame fear. A faith that is shaped by God's spirit and which costs greatly and is worth infinitely more. So discover how to live like Elijah and not let feelings of failure stop you from having a faith that can withstand anything. Discover a faith for all seasons. Faith For All Seasons by Jeff Lucas was published by CWR in October 2016 and is our 3414th best seller. 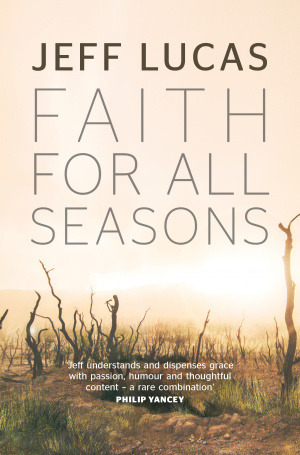 The ISBN for Faith For All Seasons is 9781782595397. Be the first to review Faith For All Seasons! Got a question? No problem! Just click here to ask us about Faith For All Seasons. Elijah called fire down from heaven. Raised the dead. Organised the weather. But Scripture makes it clear: he was a fragile, flawed human being, just like us. He had stood boldly before a pair of royal psychopaths and told them some very unpalatable truths. But there would come a time when, threatened by the palace, he would run for his life, and then prayed for death. Holed up in a cave, he experienced depression and hopelessness. God restored him tenderly, with some very practical directions. Failure and fear were not the end for him. As followers of Jesus, we share some of the same challenges that Elijah faced three thousand years ago. Life was cheap. The nation had lost its sense of a core story, a God-centred narrative that would keep it on track. Immorality was rampant. True believers felt a keen sense of threat. But if we share Elijah's challenges, then we have another vital reality in common: he was a man of the Spirit, and we, too, are not just people who are trying to imitate Jesus, but are those who are filled with the same Holy Spirit that rested upon Elijah. We'll see that yesterday's episodes of bravery and trust don't guarantee faithfulness today. That God is kind, gently but firmly helping Elijah through his season of depression. That doing what God commands might be costly, but it's the way to breakthrough. And that God is sufficient for the whole of life, not just the sunnier days.